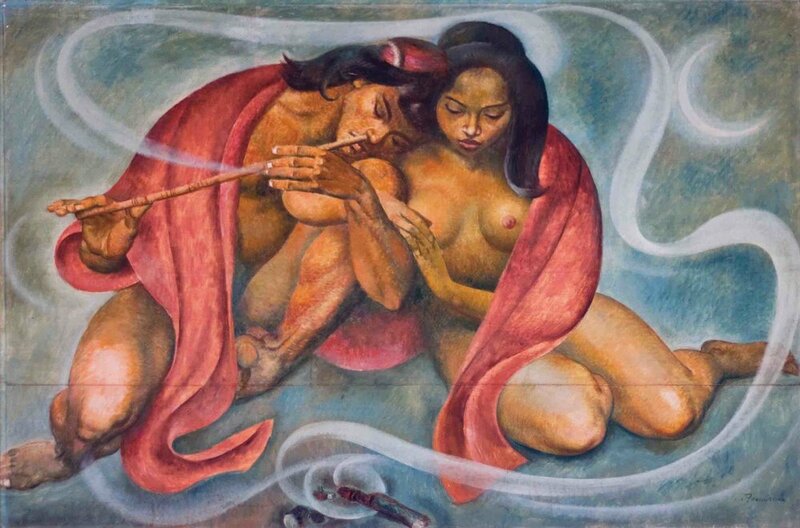 Botong Francisco, ‘The Nose Flute’, 1955, oil on canvas, 121 x 182 cm. Image courtesy of LARASATI Auctioneers. Leon Gallery has been making waves in the Manila art market ever since its first sale in the Philippine capital in 2012, giving the local art market an auction platform that has grown considerably since then. Its 8 September 2018 sale efficiently cleared a neat 85% sold by lot, with the top lot, ‘The Nose Flute’ by Carlos "Botong" Francisco (USD1.17 million/ PHP63 million), previously sold by United Asian Auctioneers, Hong Kong in 2012, reappearing in this sale as a lot sold in partnership with One East Larasati, Hong Kong. The sale registered the third highest priced painting ever sold via auction in the Philippines. Leon Gallery’s partnership with the Indonesian-owned auctioneers, One East Larasati, for the sale of this painting makes an interesting case study for local auctioneers in the fragmented country markets of Asia. Having sourced a work beyond one’s established domain, “giving” it to a counterpart auctioneer with more reach to the artwork’s natural audience may sound like the most logical thing to do. In reality, for various reasons, this is rarely done. Leon Gallery and One East Larasati’s collaboration proves that the dominance of the two big auction houses — Christie's and Sotheby's — can be threatened if more local auctioneers in Asia reach across to their counterparts to market a relevant consignment. Fernando Zobel, ‘Saeta 52’, 1958, oil on canvas, 91 x 122 cm. Image courtesy of Leon Gallery. Alfonso Ossorio, ‘Ascension (Vertical); Cross-Section (Horizontal)’, this work can be displayed horizontally, with the title ‘Cross-Section’ or vertically, with the title ‘Ascension’, 1956-57, oil, enamel and plaster on masonite, 61 x 244 cm. Image courtesy of Leon Gallery. The depth of appreciation for post-war abstraction is a distinguishing façade of the Philippine art market, and this sale saw two outstanding prices made: Fernando Zobel's ‘Saeta 52’ achieved USD646,000/ PHP35 million, the top price for a Saeta series painting achieved outside of the mainstay Hong Kong auctions; and Alfonso Ossorio's ‘Ascension (Vertical); Cross-Section (Horizontal)’ sold for USD431,000/ PHP 23.3 million, a close second only to the record price for the artist established by Christie’s Paris in 2016.